Material: Cotton, soft and breathable fabric,and comfortable to wear. Features: Short sleeves, crew necklines for easy on/off dressing, elastic waist band, non-slip and painless, easy on/off. Machine wash.
Design: Baby suit fashionable and stylish, cartoon giraffe/flamingo/moon and stars design on the pajamas set, make baby more adorable, baby\'favorite. Attention Customers: Sizes design for children 1-7 years old, you can choose one size up if your child is taller than average, please check the size carefully before ordering. 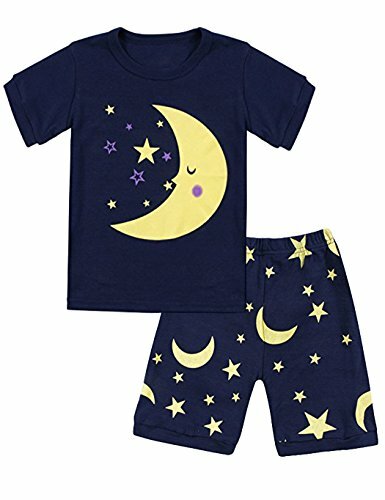 Cool moon and stars sleepwear!